The latest news from Southwark Council is that 22 shops in Nunhead have signed up to the shop front improvement scheme! Apparently, planning consents have been granted and the project managers are currently finalising the graphics and works package with shops. They expect to start on site in October. These improvements have the potential to bring about a huge, and hopefully positive, change for the high street, with lots of new signage and works to improve the building fabric and appearance of individual shops. Nothing to do with Nunhead regeneration we know….but worth posting anyway! The Village Hall Experience is a free festival and two shows on Peckham Rye Common on 17th August. The festival runs from 1pm until late, and the shows will run at 3pm and 7pm. This community extravaganza will feature all the best things that have ever happened in a Village Hall, with cake, pet and vegetable competitions, dance classes, Taekwondo exhibition, art gallery and live music. The Village Hall Experience will also feature: Nunhead Community Choir, Walkabout Whiskas, Automata, Puppets, Jumble sale, Village Hall Disco, cooking and ping pong. Shows will feature: Men in Coats, Stephen Frost, Madam Magenta, Martin Soan, Teenage Men, DJRatsmilk, Vincent Figgins, Pierrette S’Cobaz, Tina Turner Tea Lady – and more! There will also be market stalls, food and drink, Peckham Pathe Cine News Theatre and Rye Books – story telling tent. The Red Brick Monolith (shown in an image in an earlier post) is currently with the Southwark Council planning committee. The consultation period officially ended on 31 July, but Southwark Council can still take account of your objections by not giving it planning permission. GET WRITING! Here are the email addresses of all the members of the planning committee and a template you can send. Please, please do not allow the planning application for the Nunhead Green Early Years Site development go through. The proposed building, designed by The AOC, is not suitable at all. Especially as this is the prime location of a Conservation area. The majority of the housing stock in Nunhead is either Georgian or Victorian. All made from London brick. The proposal for a red brick monolith is absurdly out of place. It’s a mishmash of styles that make no sense whatsoever. In reality it looks like a cross between a retirement home and a doctors surgery, one that was badly designed in 1980. It is awkward and clumsy. The chamfered leading edge is truly hideous in it’s pyramid proportion. This building could be well suited in another town such as Portsmouth or Aylesbury, but it says absolutely nothing about London or Nunhead. We’re so very proud of our capitals heritage and would like the new building to represent that for us. We have a truly rare opportunity to significantly, and gracefully, enhance this area, to flagship the Nunhead regeneration, and we are in serious danger of missing it. I urge you to consider an alternative rather than permanently, and irrevocably, scar our beloved Green. It has the potential to be so beautiful, for us and for future generations. Please, please allow it to be so. Also included here is a mock-up of what the Green may look like with the same kind of buildings that have recently been built on Camberwelll Grove. Both the mock-up and the letter template come courtesy of Jon Gibson-Skinner, on the Nunhead section of South East Central forum. We may have missed the boat a little in terms of protesting – we all get distracted by life – but that is no excuse for not acting while there is still a chance to make a difference. Please contact Southwark Council today! Nunheaders, apologies for the error below, the consultation on Saturday is about the landscaping of the Green, not about the red-brick monolith being built on the site of the early learning centre. Sadly, the consultation period for that ended on 31 July. However, planning permission has yet to be given. Another post will follow shortly with details of how you can still make your feelings known…. Nunheaders – do you like the plans for Nunhead Green? The members of Nunhead Nags do not. It looks like a big, red-brick monolith built to match the Old Nun’s Head rather than to draw on the history of the other, more historic, buildings around the Green. Let’s ignore the wood clad building next door to the pub…. 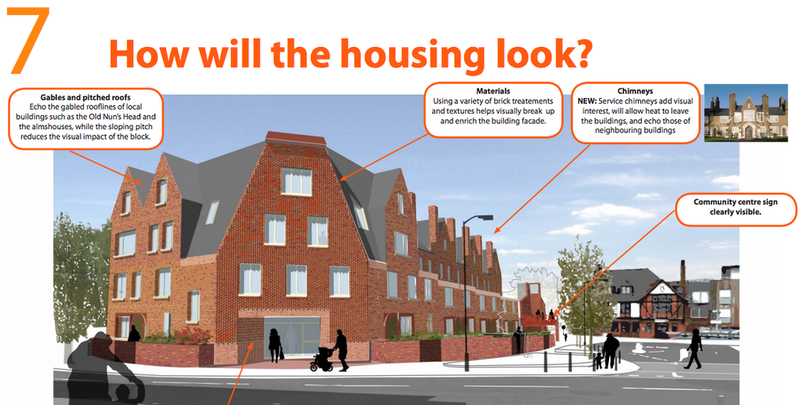 Why is the new development not using the London Stock bricks that are the most common material for the buildings in Nunhead? We should remember that Nunhead Green is a conservation area. It does not feel like this development respects this designation. Whatever your views, please come and talk to the developers and the council tomorrow. This is our last chance to influence any decisions made about this crucial space in Nunhead. This is what the corner of Nunhead Green could look like. Is this what Nunheaders want? The next stage of the Nunhead Green improvements project happens on 3 August. This is the third and final of the three scheduled consultation events, at which AOC will be presenting a set of developed design proposals for The Green. According to AOC, their current proposals have been significantly informed by the last public consultation event in June, for which a feedback report will shortly be placed online. A summary of community feedback will also be presented as part of the next consultation. This next stage will take place on Nunhead Green itself (weather permitting) on Saturday 3 August from 11am to 3pm. Should it be raining, it will move to the library on Gordon Rd instead. AOC say that the designs and feedback questions will also be available online for a week from Monday 5 August until Sunday 11 August for community comment. And will remain there for information after that date. So, Nunheaders, make sure you get to the meeting if you can, and tell the project organisers and Southwark what you think of the plans. It’s your money, being spent in your local area! When it’s built it will be too late to moan. Lighting under the bridge – do you like it? We’ve had some feedback from Nunheaders that they are very disappointed with the lighting under the railway bridge. We at Nunhead Nags tend to agree. The light effect itself is fine – and are in line with the designs we were given. However, the covers to the bulbs look very cheap.